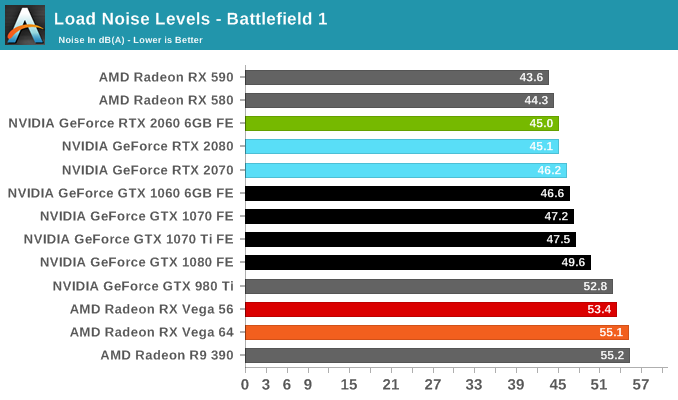 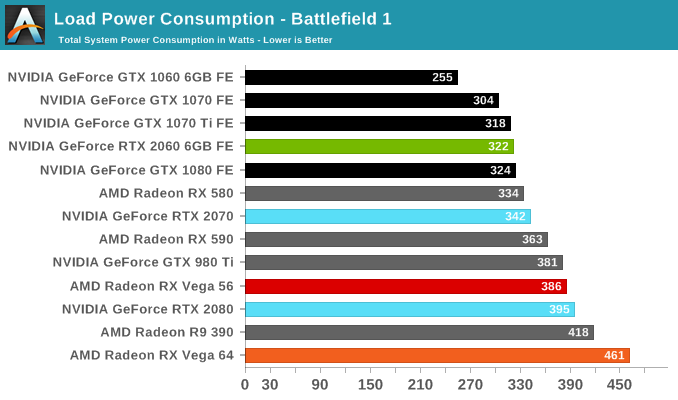 Battlefield 1 has made the rounds for some time, and after the optimizations over the years both manufacturers generally enjoy solid performance across the board. 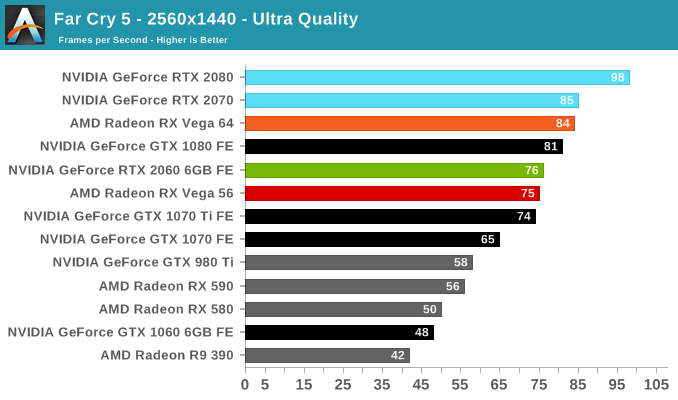 The RTX 2060 (6GB) is no exception and fares well, splitting the difference between the GTX 1070 Ti and GTX 1080. 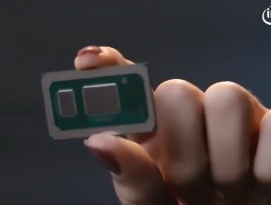 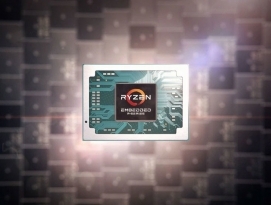 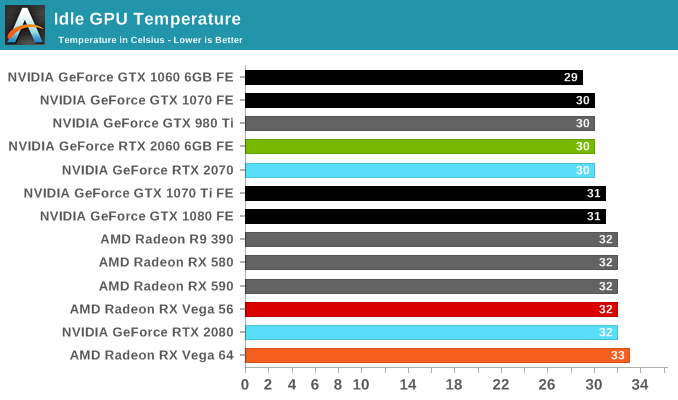 This also means it opens a lead on the RX Vega 56. 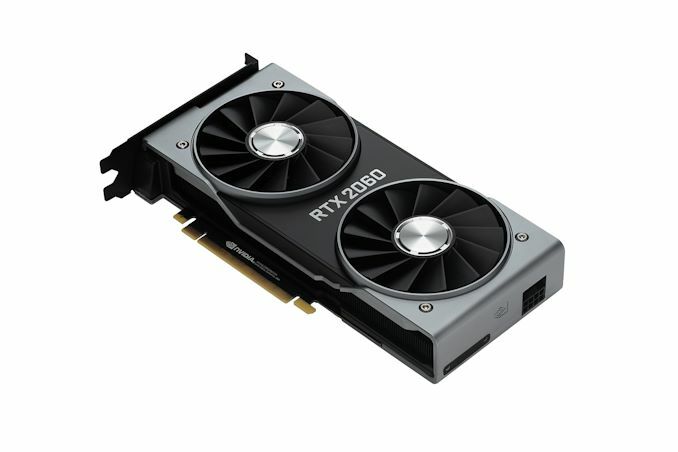 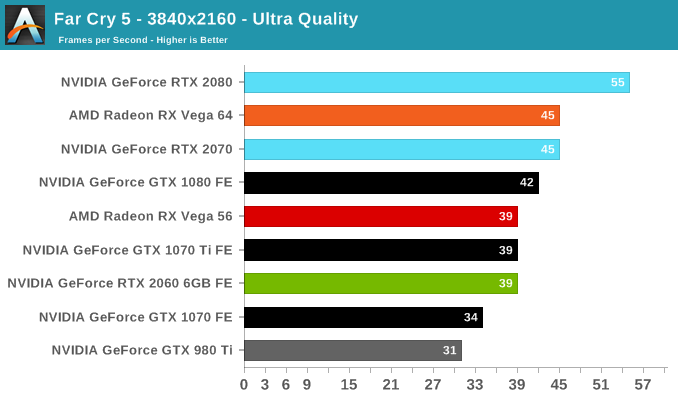 Somewhat surprisingly, the RTX 2060 (6GB) performs poorly in Ashes, closer to the GTX 1070 than the GTX 1070 Ti. 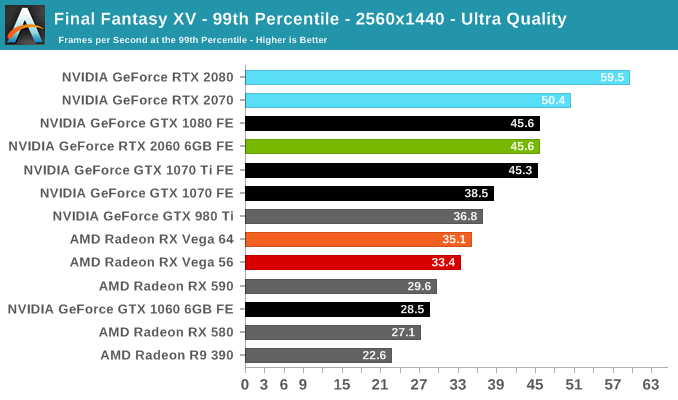 Although it is still ahead of the RX Vega 56, it's not an ideal situation, where the lead over the GTX 1060 6GB is cut to around 40%. 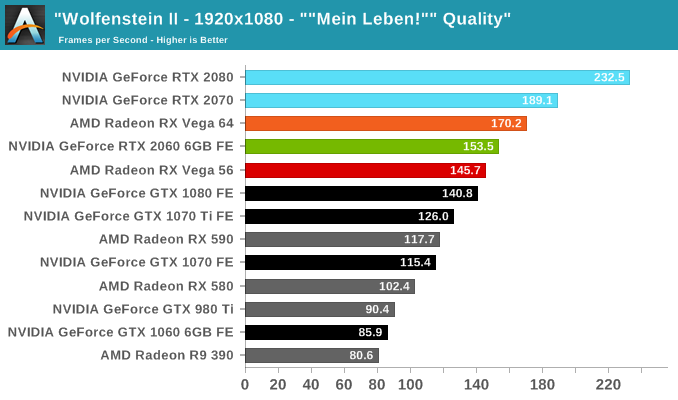 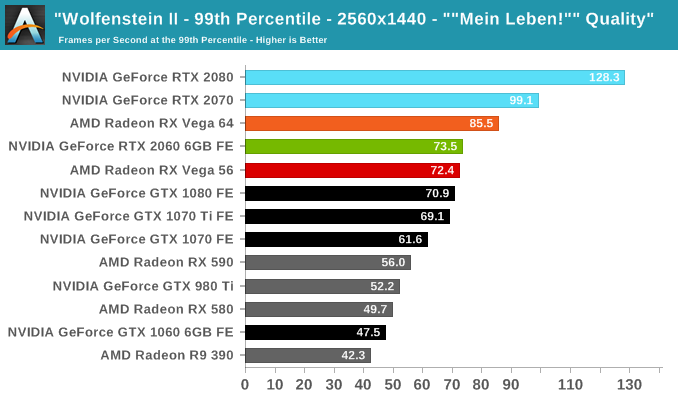 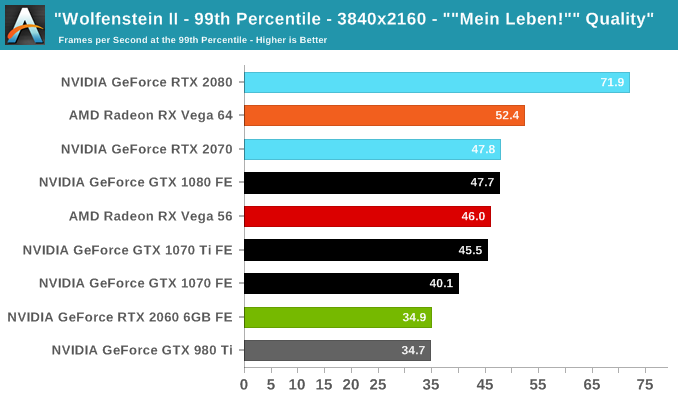 In summary, Wolfenstein II tends to scales well, enables high framerates with minimal CPU bottleneck, enjoys running on modern GPU architectures, and consumes VRAM like nothing else. 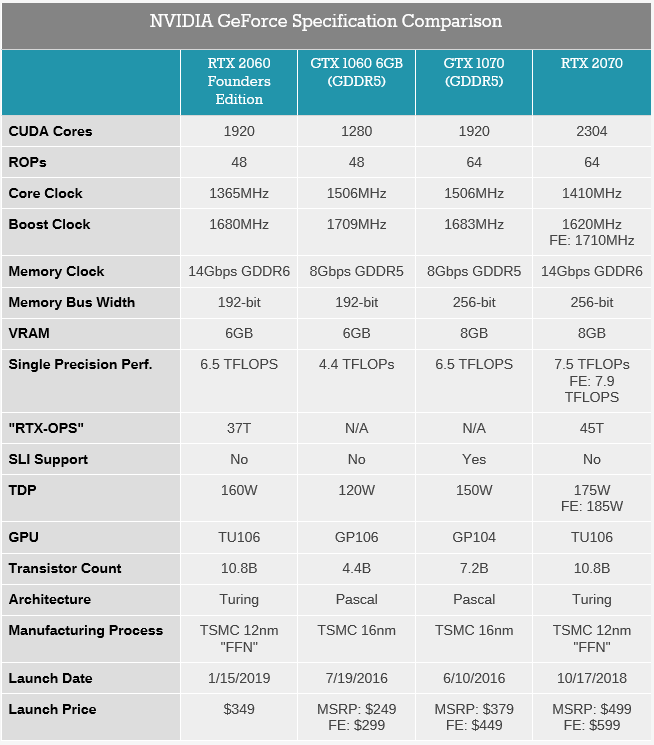 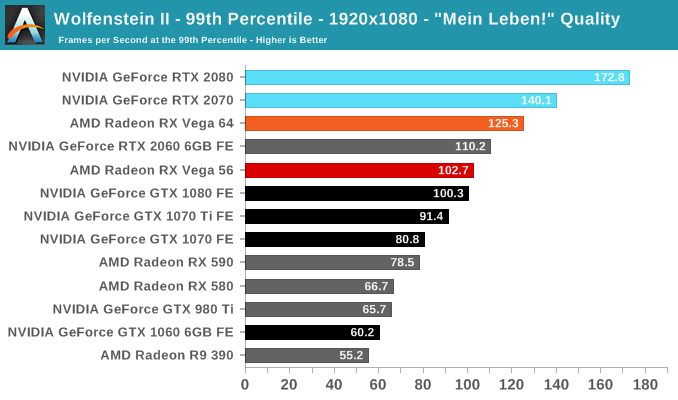 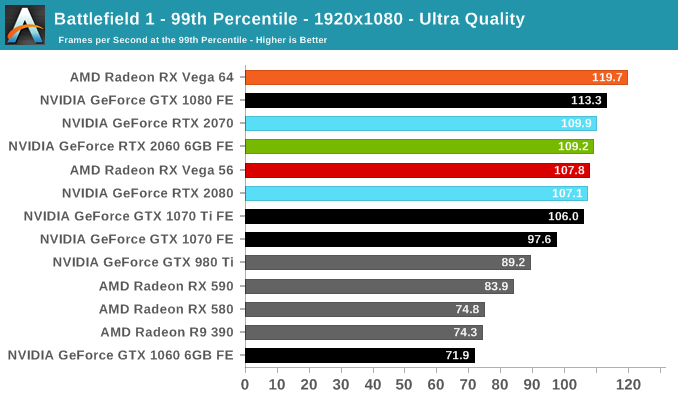 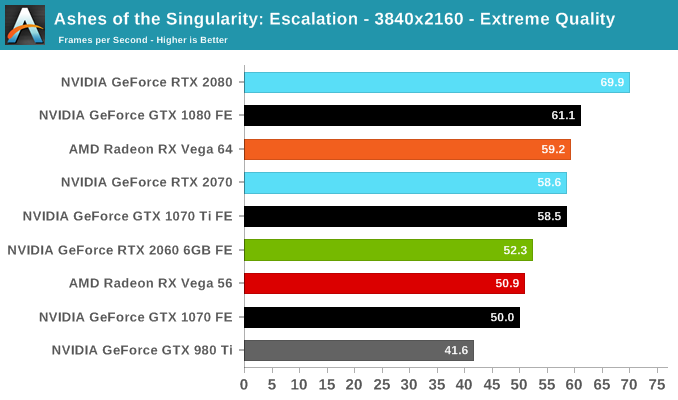 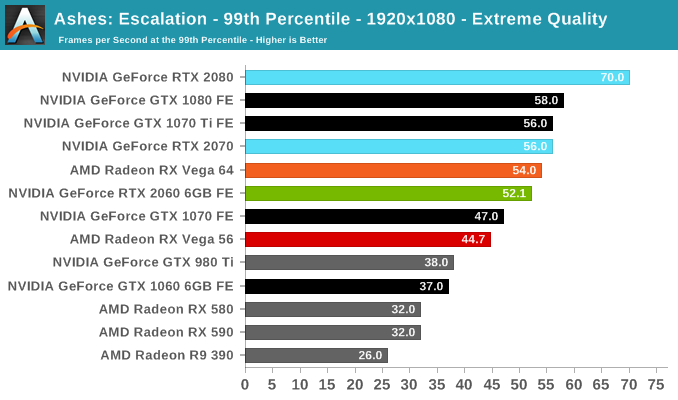 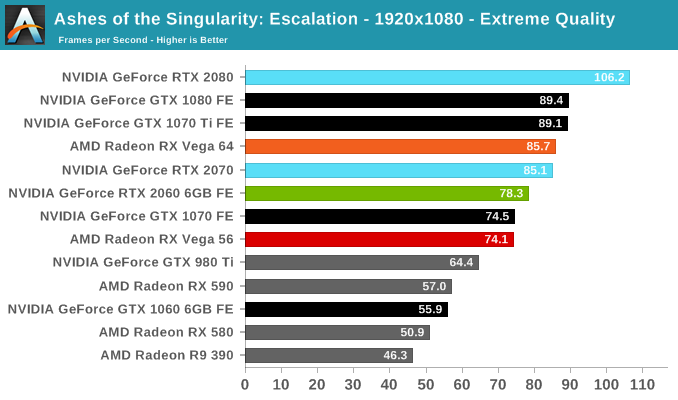 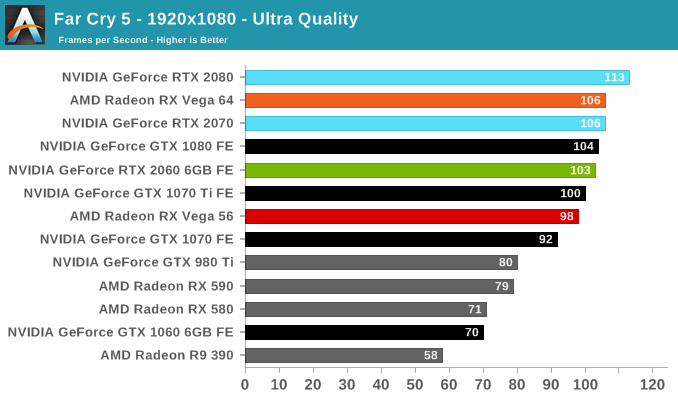 For the Turing-based RTX 2060 (6GB), this results in outpacing the GTX 1080 as well as RX Vega 56 at 1080p/1440p. 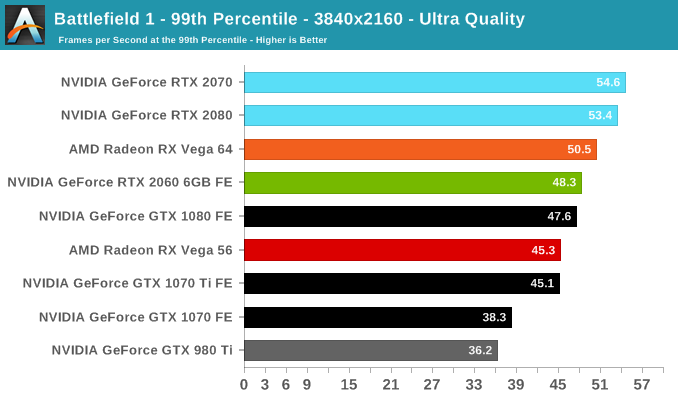 The 4K results can be deceiving; looking closer at 99th percentile framerates shows a much steeper dropoff, more likely than not to be related to the limitations of the 6GB framebuffer. 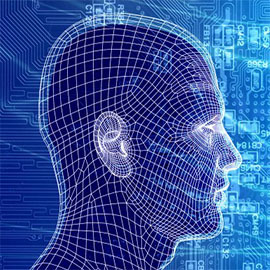 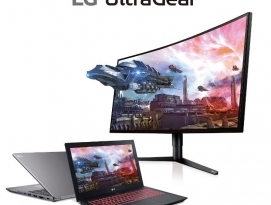 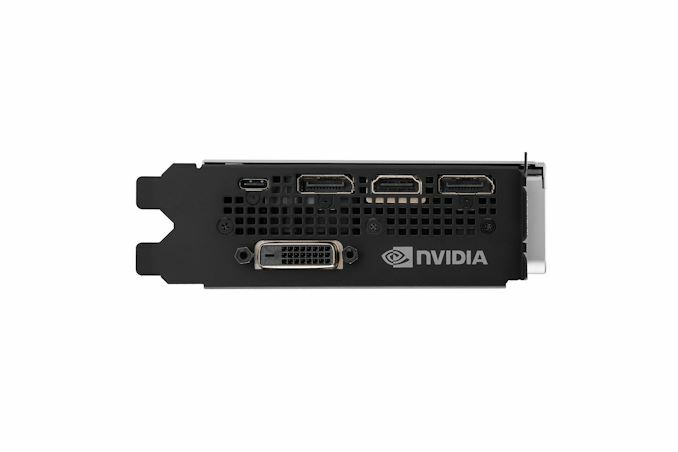 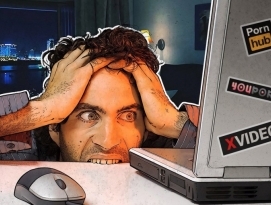 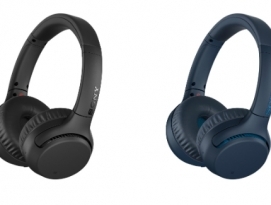 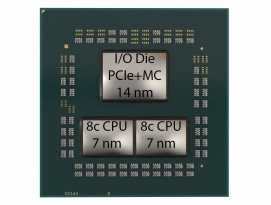 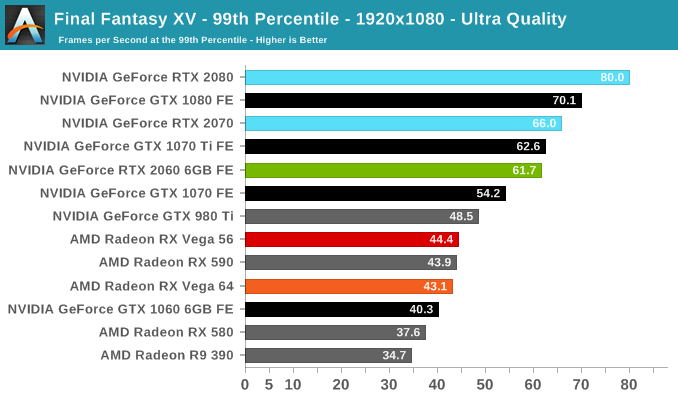 We've already seen the GTX 980 and 970 struggle at even 1080p, chained by 4GB video memory. 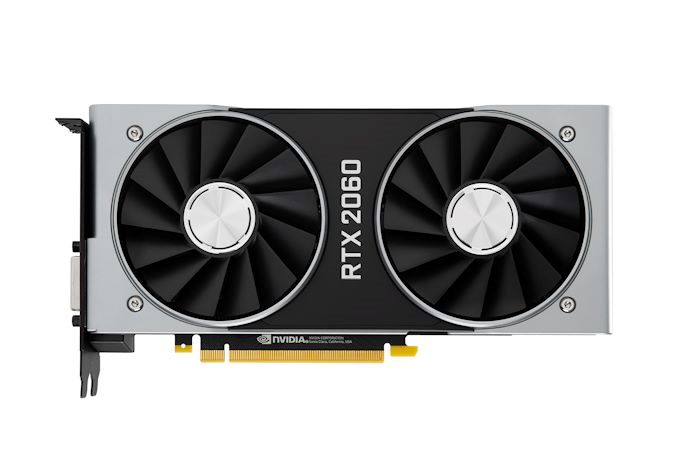 At 1080p and 1440p, the RTX 2060 (6GB) returns to its place between the GTX 1080 and GTX 1070 Ti. 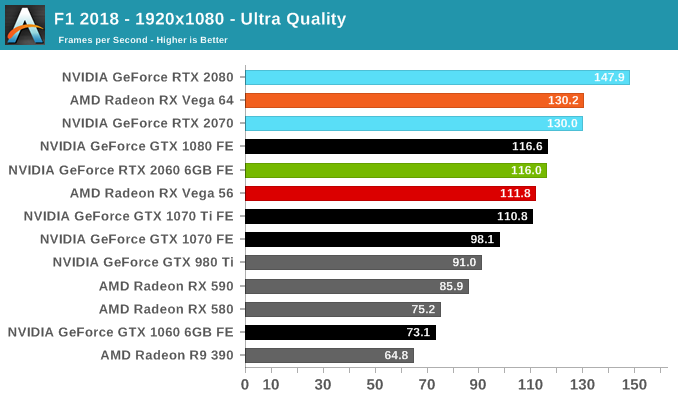 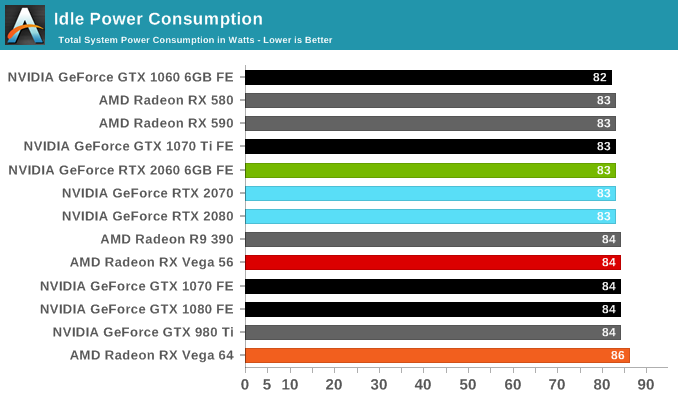 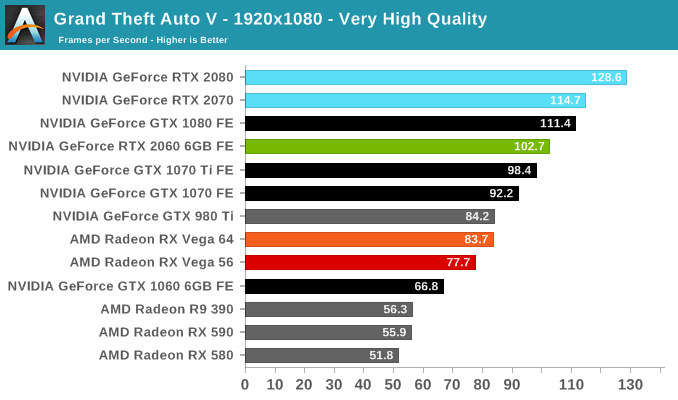 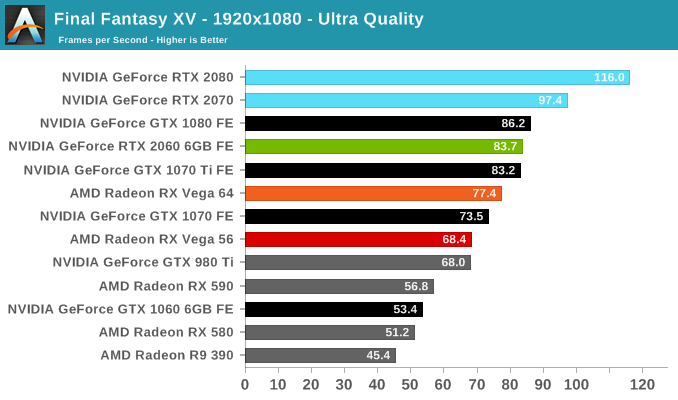 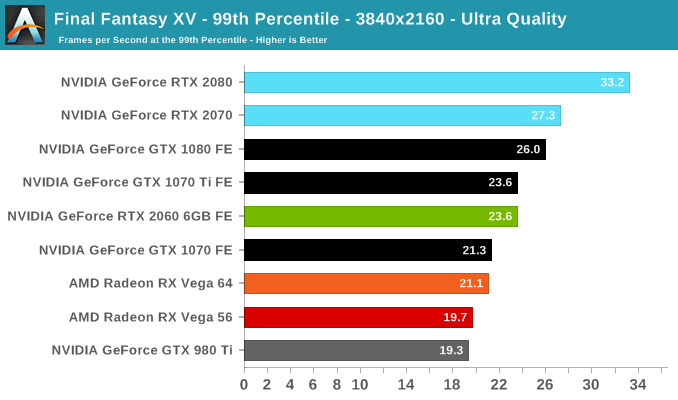 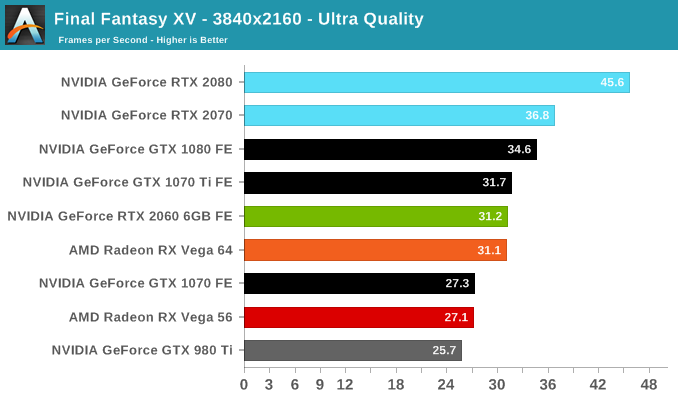 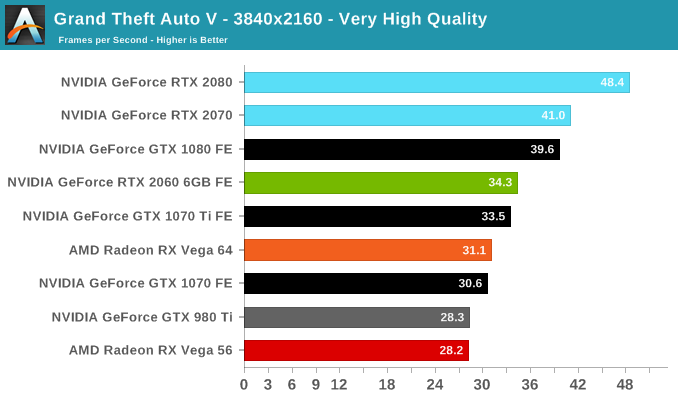 Final Fantasy is less favorable to the Vega cards so the RTX 2060 (6GB) is already faster than the RX Vega 64. 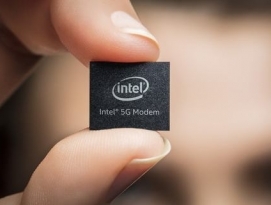 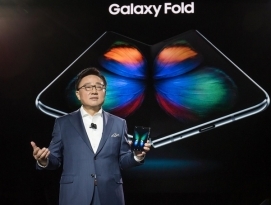 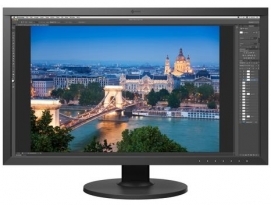 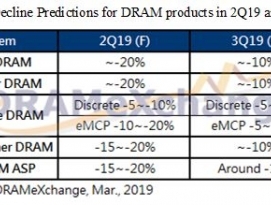 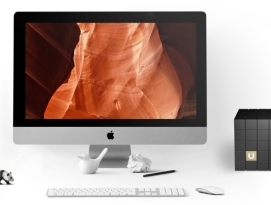 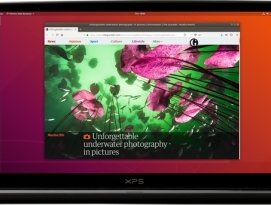 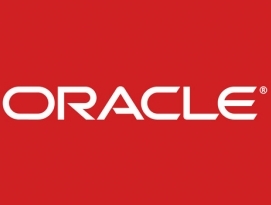 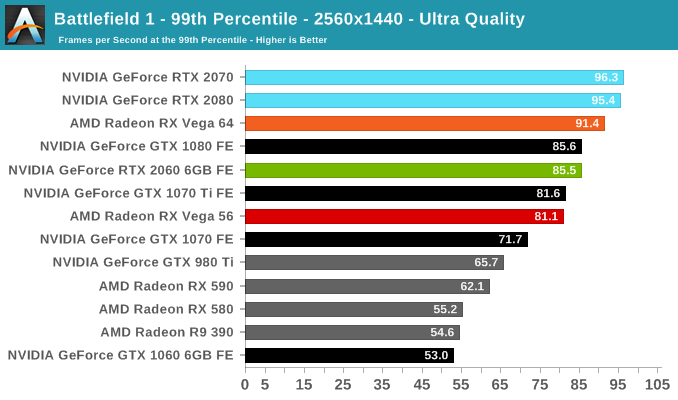 With the relative drop in 4K performance, there are more hints of 6GB being potentially insufficient. 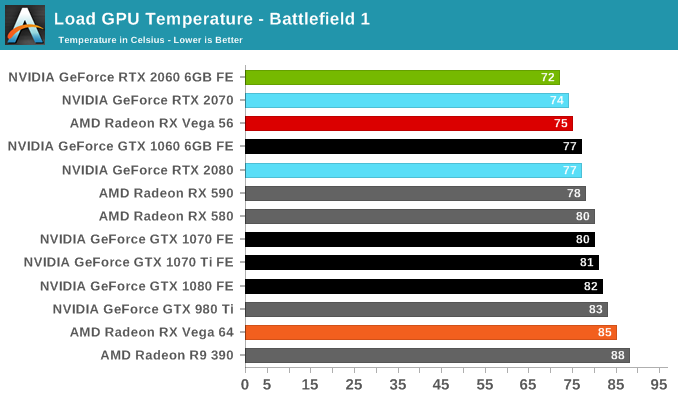 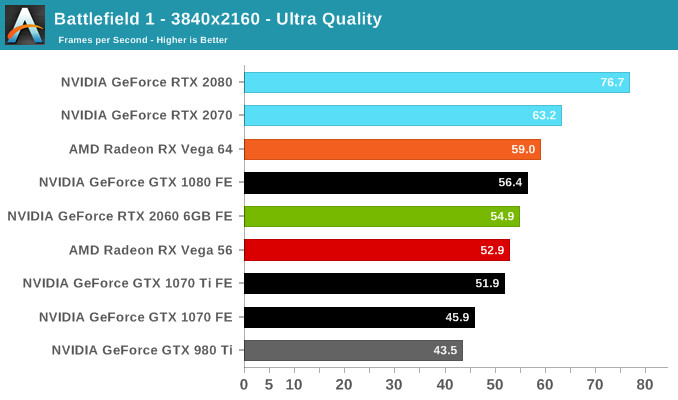 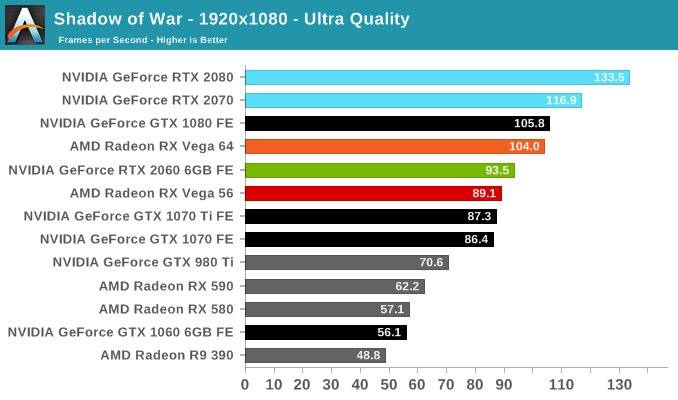 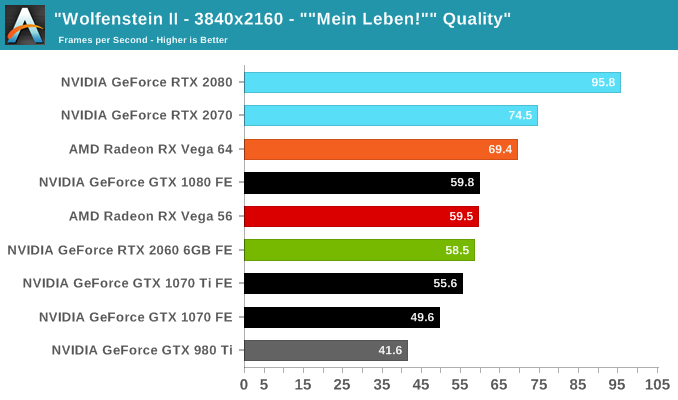 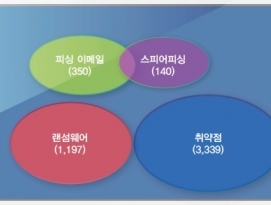 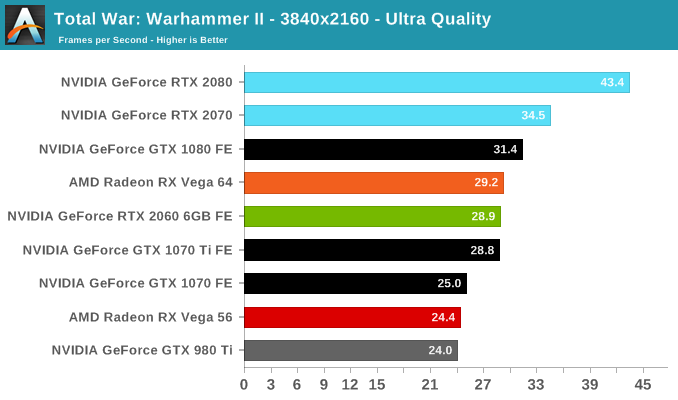 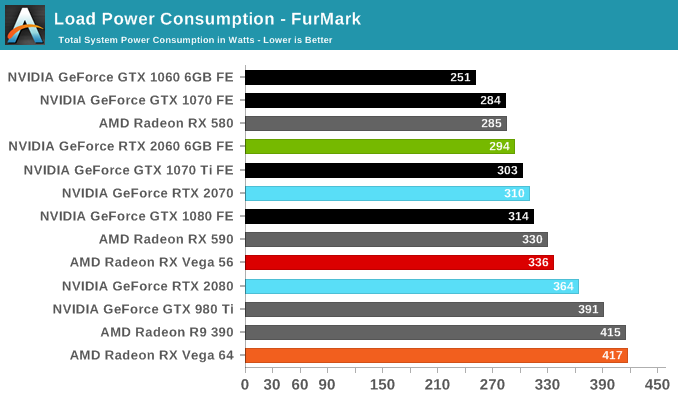 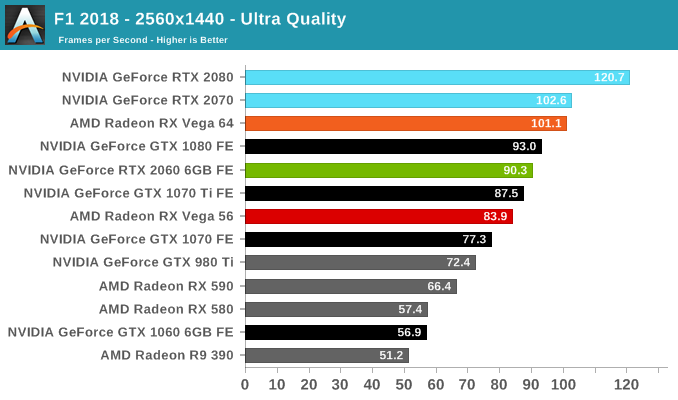 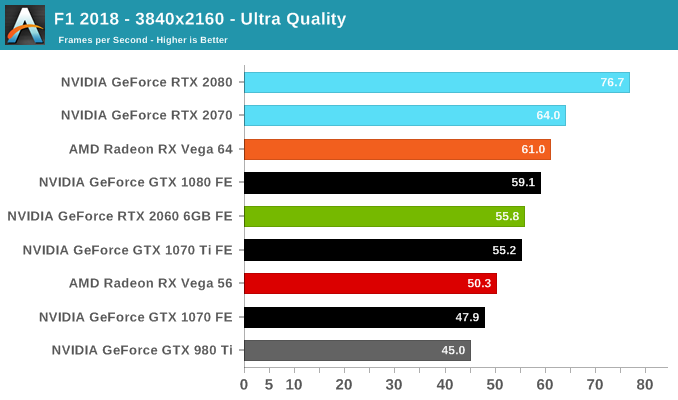 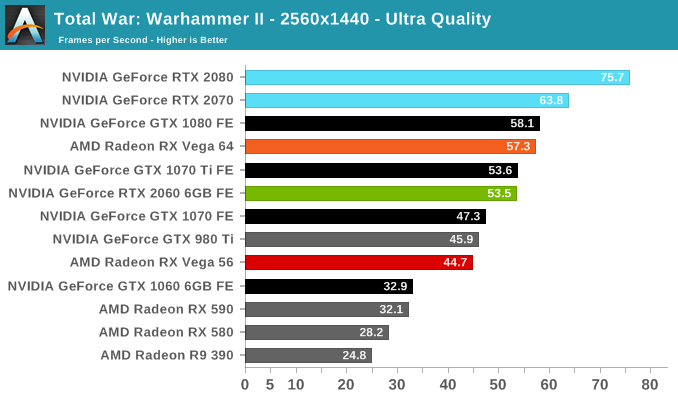 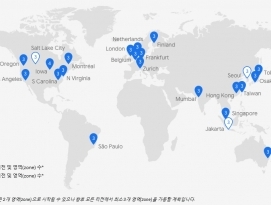 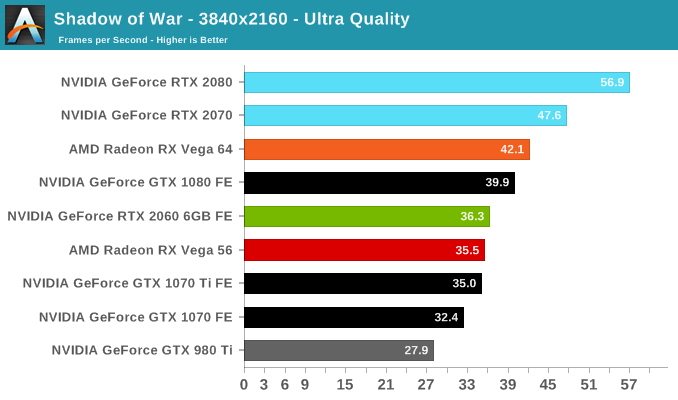 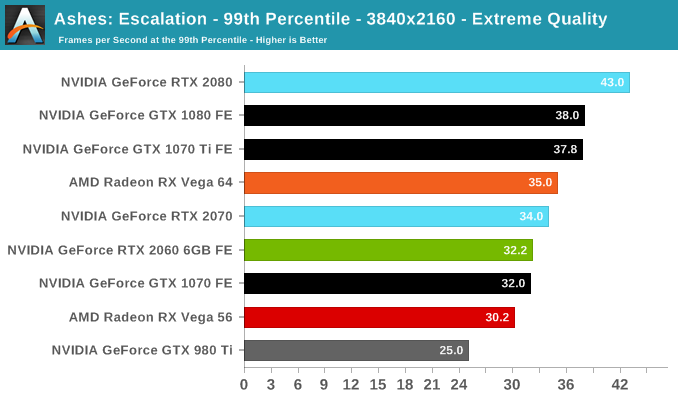 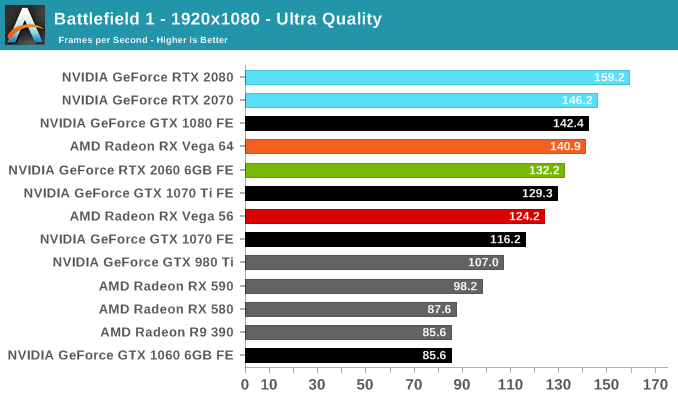 NVIDIA hardware tend to do well here, and for all intents and purposes the RTX 2060 (6GB) FE is equivalent to the GTX 1070 Ti FE in performance. 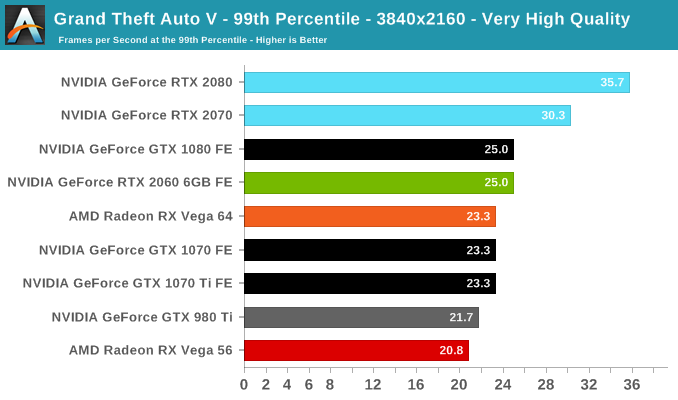 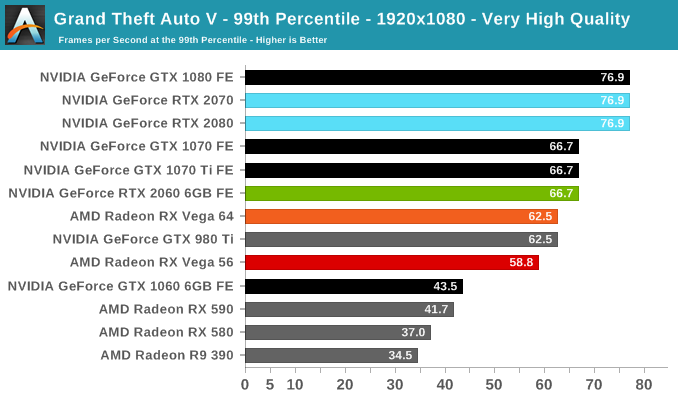 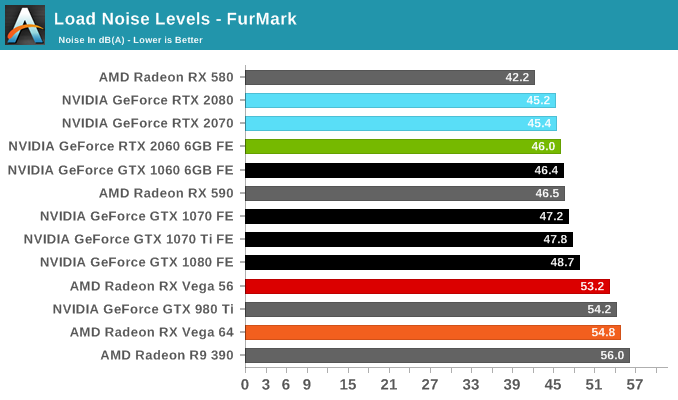 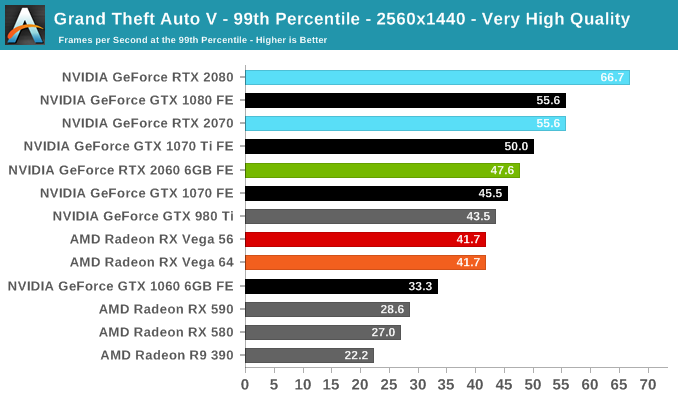 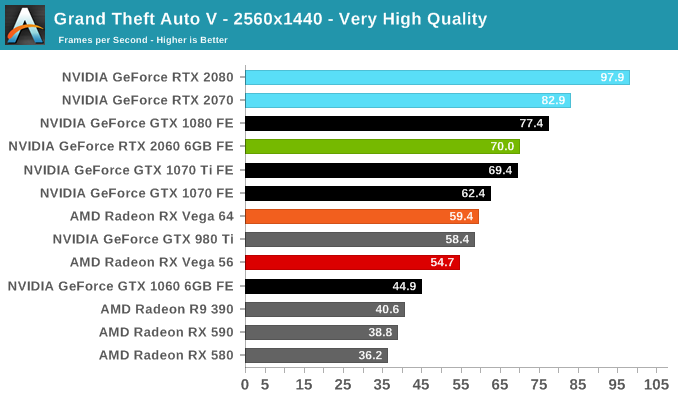 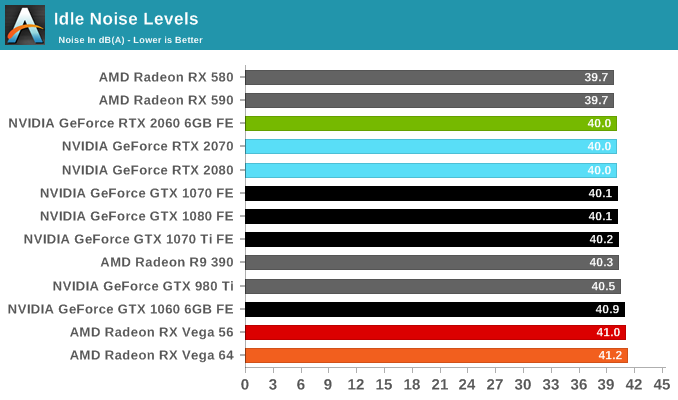 Which means that the RTX 2060 is essentially on the level of the RX Vega 64, an ideal position for it to be in. 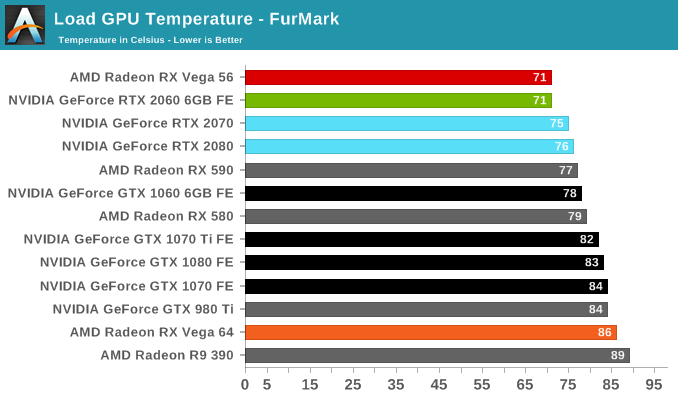 With an open air cooler design with dual axial fans, the results are in line with what we've seen with the other RTX Founders Editions.